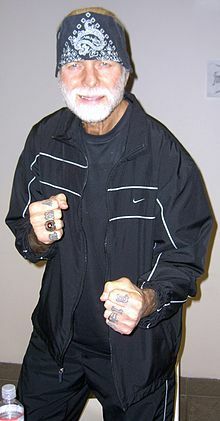 James Harold Fanning  (born August 6, 1942) is an active professional wrestler and author better known as Jimmy Valiant. Jimmy Valiant was born in Tullahoma as the youngest of five children of James and Effie Fanning. He later incorporated the names of his four sisters – Louise, Christine, Charlena and Patrica – into the spider web tattoo on his upper arm. He later moved to Willingboro Township, New Jersey. He married Clara, with whom he fathered three children: Robin, Rhonda, and Dana. With Monika, he has his first son Todd. With Felicia, he has his youngest son Handsome. He is now married to Angel. He has 6 grandchildren: Lonna, Jenae, Beau, Chassie, Clarissa, and Delilah. Valiant had entered the WWWF as a babyface, originally known as "Gentleman Jim Valiant," but quickly switched to heel. He had title matches against champion Pedro Morales in secondary arenas, such as Philadelphia, and feuded with short-term tag partner Chief Jay Strongbow. Jimmy and his kayfabe brother Johnny held the tag belts and main evented Madison Square Garden against Chief Jay Strongbow and Bruno Sammartino (Strongbow and Sammartino won 2 out of 3 falls, but one fall via disqualification; hence the belts didn't change hands). In the early 1980s, Valiant returned as a babyface to NWA's Jim Crockett Promotions as "Boogie Woogie Man" Jimmy Valiant and called his fans "The Street People". His theme music around this time was "Boy From New York City", by The Manhattan Transfer. While in Jim Crockett Promotions, he would sometimes appear in a black bandit-style mask and call himself Charlie Brown from Outta Town. This usually occurred when Valiant was (in kayfabe) banned from wrestling. Charlie Brown was billed as someone other than Valiant, despite "Brown" having Valiant's legendarily prodigious beard. January 1984, Valiant was attacked by Paul Jones and The Assassins. They tied him to the wrestling ring ropes so that Jones could cut his beard off. This led to a grudge match (with hyped supershow called 'Boogie Man Jam '84' in Greensboro, North Carolina. For this match Dusty Rhodes in Valiant's corner was tied by a rope to Paul Jones. Valiant defeated Assassin II, who was unmasked and revealed as Hercules Hernandez. Due to the beard cutting attack, he feuded heavily with Paul Jones and his army of wrestlers, from 1984 through to late 1986. This army of wrestlers included The Barbarian, Baron von Raschke, Teijo Khan, and The Assassins. During this three-year feud, Valiant received help from Héctor Guerrero and "Raging Bull" Manny Fernandez. Although Jimmy Valiant would lose a Loser Leaves Town Tuxedo Street Fight to Paul Jones at Starrcade 1984 in Greensboro, North Carolina the feud with many from the Paul Jones stable continued, which would come to include Abdullah The Butcher. In 1985, Valiant and Ragin' Bull Manny Fernandez formed a team called B and B Connection ("Boogie Woogie" and "Bull"). In the spring of 1986 Pez Whatley turned on Valiant, shaved his head, and joined Jones' Army as Shaska Whatley. During The Great American Bash 1986 summer shows, Paul Jones adopted a military style look in his long feud with Valiant and labeled his stable of wrestlers The Army. Valiant would beat Shaska Whatley in a hair vs hair match, but with outside interference lost a hair vs hair match to Paul Jones only weeks later. In the fall of 1986, The Ragin Bull Manny Fernandez, Valiant's best friend accepted Jones' money and turned on Valiant, starting a feud between the two. Paul Jones at this point shortened his army to his newly acquired tag team of Ragin Bull and Rick Rude. The war between Valiant and Paul Jones climaxed at Starrcade 1986 with Valiant putting up the hair of his valet Big Mama against the hair of Paul Jones in a No DQ Match which Valiant won (while the Ragin Bull was placed in a cage above the ring). In the late 1980s, he teamed with Hector Guerrero (then masked as Laser Tron) and Bugsy McGraw and feuded with The New Breed. When Jim Crockett Promotions became WCW, Valiant left and returned to Memphis to wrestle in the USWA. Since then, Valiant has primarily wrestled in the independent having his most recent match on March 2nd 2019 in Johnson City Tennesse.He now enjoys his time with his wife Angel and training wrestlers at Boogie's Wrestling Camp located in Shawsville, Virginia. However, Valiant recently wrestled on November 25, 2012 with The Ragin' Bull Manny Fernandez as his tag team partner in Winston-Salem, North Carolina. Jimmy currently wrestles under the ACW Banner (American Championship Wrestling) around the Roanoke Virginia Area. He has also recently wrestled with George South, Stan Lee and Ricky Morton in ASW Wrestling and New OCW in Ashland, KY with Matty B and Violet Rayne against Beau and Misty James and Scotty Ace. Valiant remains in the wrestling world today with continuing to appear at independent shows signing autographs while his students, appear in a few matches on the card. [ citation needed] He keeps in touch with fans through his official Weekly website.And he is especially looking forward to stepping into the ring in 2020 and continuing his decades long career officially beginning his 7th decade in the business. Most recently, Valiant lent his name to a foreword for a fiction novel called "Only The Beginning" It is a book set in the 1980s about a girl's life during high school. While the book is not wrestling related, the author Jason Strecker is a personal friend of Valiant's and in the forward Valiant responds to his friendship with the author along with the book's message of being of strong character and doing positive actions for others. The book also has a foreword by Nikolai Volkoff . Valiant in a CCW show in 2006. PWI Tag Team of the Year award in 1974 – with Johnny Valiant. PWI ranked him # 274 of the 500 best singles wrestlers during the "PWI Years" in 2003. ^ Johnson, Steven (May 25, 2004). "From 'Handsome' to 'Boogie' and back". Canadian Online Explorer. Retrieved 2009-02-16. ^ Heenan, B: "Bobby The Brain: Wrestling's Bad Boy Tells All. ", page 18. Triumph Books, 2002. ^ "Independent Wrestling Results – July 2004". onlineworldofwrestling.com. Retrieved 2008-07-05. ^ "SCW Hall of Fame". SCW Superstars. SCWprowrestling.com. 2002. Archived from the original on October 5, 2002. Retrieved April 15, 2012. 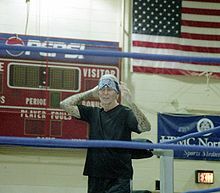 Wikimedia Commons has media related to Jimmy Valiant.